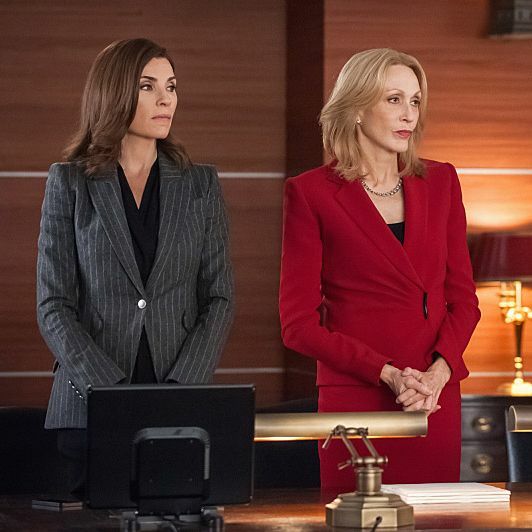 There’s a lot to say about last night’s great episode of The Good Wife, back on point after last week’s brief … fever-dream of an aberration. But before we get to that, a brief quibble: I love Ana Gasteyer, and I love The Good Wife’s running gag of having a judge obsessed with making lawyers and clients qualify statements with “in my opinion.” But I wish Ana Gasteyer wasn’t that judge — she’s so hilarious, and we see so little of her lately, which makes her showing up to nod severely a couple of times feel like a bit of a waste. Still, she’s back, and adjudicating the case for which Alicia and Elsbeth have teamed up to defend the complicated, Trojan-horse-style charges that AUSA Josh Perotti (Kyle MacLachlan) is bringing against Camilla Vargas and J-Serve. Perotti throws out a lot of scary terms like proprietary software and economic espionage, but it’s pretty clear that he’s far more interested in an evening with Elsbeth than a conviction. Their chemistry together is patently absurd, as are their mutual abilities to bring each other down with olfactory kryptonite (his is baby lotion, hers is Old Spice). It’s ridiculous — actually, properly ridiculous — especially when you realize that you’re essentially watching a really twee little rom-com about opposing lawyers folded into the story line of what’s typically a very serious, dramatic show. But that’s one of my favorite things about The Good Wife: It doesn’t take itself any more seriously than it absolutely has to. And besides, any story line that somehow ends with Kyle MacLachlan and Carrie Preston ripping each other’s clothes off, with actual flying buttons, all while “Call Me Maybe” plays, is absolutely fine by me. This version of Elsbeth, wacky and wonderful, is much more preferable to the broader version with the overly simplified inner life that we saw last week. I don’t need scary clowns or dancing cruise ships; I’m fine seeing someone weird and imagining what it must be like to think the way they do instead. Plus, Elsbeth’s idea of a perfect morning after (lying on top of one’s desk, taking business calls under a pink throw blanket) is something we should all aspire to. But poor Grace — when she got that phone call from her mother, announcing that religion had come into her life again, you could see her think that maybe, just maybe, her prayers were about to be answered. But Alicia doesn’t want to hear about her daughter’s faith. She essentially just needs help cramming for an exam — an interview with Pastor Jeremiah, the televangelist every Chicago politician apparently has to go through. Because Alicia’s gone on record with her atheism in the past, she needs an answer for Pastor Jeremiah that will placate him and reassure prospective voters, the way other candidates like Chuck Schumer and Mark Kirk have. Grace tries, and acts understanding when Alicia point-blank tells her, “I can’t believe in God.” Alicia asks whether Grace judges her for it, and Grace says no and kisses her on the forehead, a moment in which Grace feels far more like the mother than the child. But a scene with Grace and her Bible study later in the episode confirms how fraught that moment must have been for her — Grace has been praying for an opportunity to share her faith with her mother, and now her fellow Christians think those prayers have been answered. Grace knows better; rather than truly reaching her mom, she’s just provided her with talking points. At best, that’s a pretty awful position to put your child in, isn’t it? Meanwhile, Cary’s afternoon at an Ivy League alumni mixer goes south after he gets too drunk with a new lady friend — did anyone else think she was some sort of plant, maybe from Castro’s office? — and accidentally takes an Uber home through part of Indiana. He arrives home to find his pre-trial services officer (Joy Grubrick, played once again by the inimitable Linda Lavin) on his doorstep, waiting to do a spot-check, and she promptly has him re-arrested. As part of her investigation into whether he should continue to be eligible for bail, she interviews Kalinda and decides she’s a bad influence. Cary’s still free on bail, then, but with no Kalinda, an ankle monitor, and a 9 p.m. curfew. It’s hard to know how outraged to be, since we still don’t have a sense of when Cary’s trial is — I remember someone saying it could be up to a year away in the season premiere, but don’t think they’ve specified since. And it’s hard to feel too sympathetic, since getting falling-down drunk with a stranger in the middle of the day when you’re out on bail seems unwise. I’m hoping we’ll get more of a sense of what’s actually going on with Cary — and with the case — soon; the sulk-and-outburst cycle is getting a little old. And finally, finally, Alicia, Diane, Cary, and Company are back at the original Lockhart/Gardner offices, after Diane manages to wrest the lease away from David Lee and Louis Canning once and for all. (In all that wrangling, Louis casually mentions that he’s in the market for a kidney transplant, so … that’s coming back again at some point, right?) Alicia and Diane walk in together, rolling their eyes over what a mess the boys left behind, and then there’s this agonizing little moment where Alicia realizes she’ll be taking Will’s old office, and then there she is, behind that desk — his — for the very first time. Diane opens her mouth but can’t think what to say, and Alicia just nods back. They’re both certainly doing a much better job of keeping it together than I am.